Located in Miami Gardens, Florida, it is home to the NFL Miami Dolphins. Completed in 1987 at a cost of $115 million, it has a seating capacity of 80,120. It was also home to the MLB Florida Marlins between 1993-2011. Originally named Joe Robbie Stadium, it has undergone a number of name changes over the years. 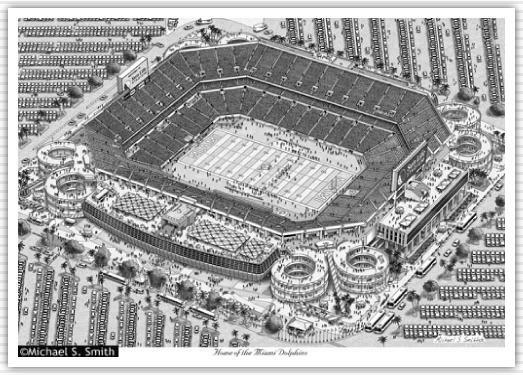 It is currently Hard Rock Stadium...this drawing depicts it's configuration before renovations which added cover for the seating area. It was named Sun Life Stadium at this time.